The superscription to Ps. xcii., chanted with Ps. xciii. 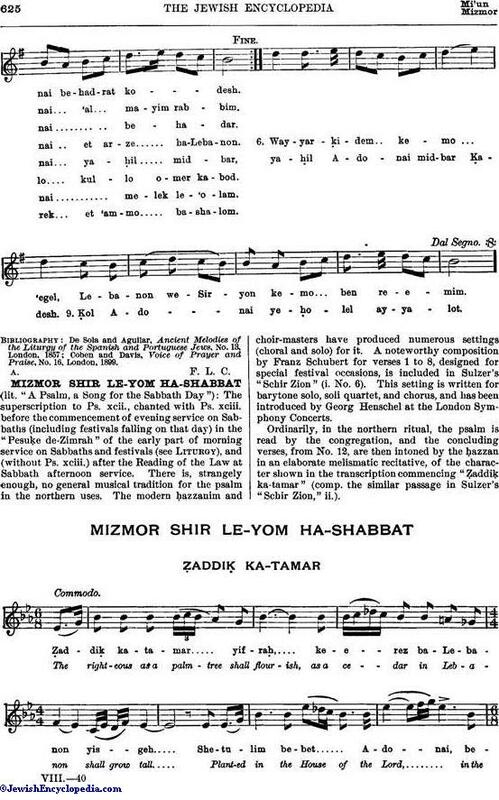 before the commencement of evening service on Sabbaths (including festivals falling on that day) in the "Pesuḳe de-Zimrah" of the early part of morning service on Sabbaths and festivals (see Liturgy), and (without Ps. xciii.) after the Reading of the Law at Sabbath afternoon service. 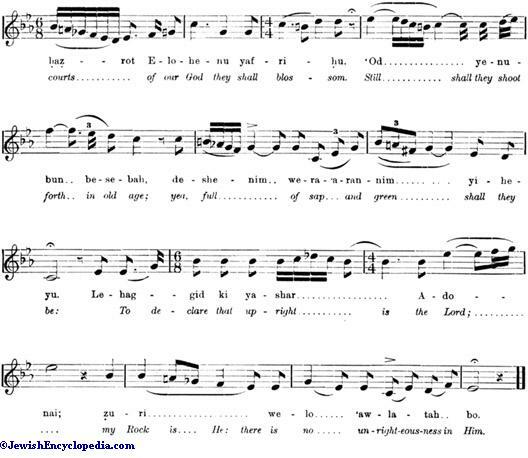 There is, strangely enough, no general musical tradition for the psalm in the northern uses. The modern ḥazzanim and choir-masters have produced numerous settings (choral and solo) for it. A noteworthy composition by Franz Schubert for verses 1 to 8, designed for special festival occasions, is included in Sulzer's "Schir Zion" (i. No. 6). This setting is written for barytone solo, soli quartet, and chorus, and has been introduced by Georg Henschel at the London Symphony Concerts. Ordinarily, in the northern ritual, the psalm is read by the congregation, and the concluding verses, from No. 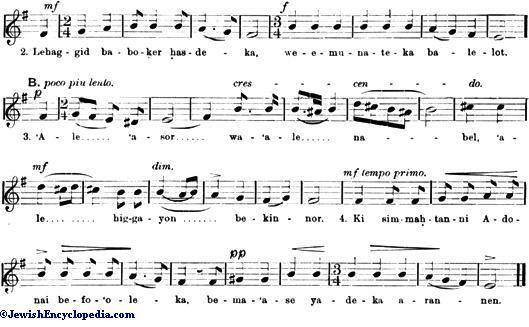 12, are then intoned by the ḥazzan in an elaborate melismatic recitative, of the character shown in the transcription commencing "Ẓaddiḳ ka-tamar" (comp. the similar passage in Sulzer's "Schir Zion," ii.). 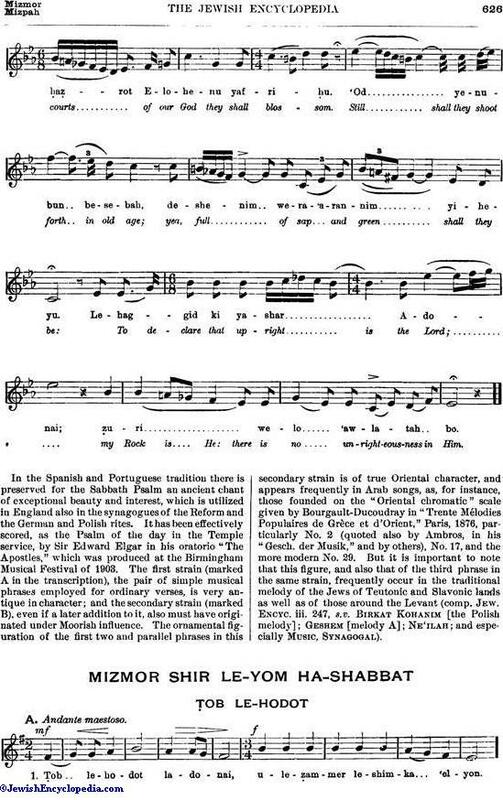 In the Spanish and Portuguese tradition there is preserved for the Sabbath Psalm an ancient chant of exceptional beauty and interest, which is utilized in England also in the synagogues of the Reform and the German and Polish rites. It has been effectively scored, as the Psalm of the day in the Temple service, by Sir Edward Elgar in his oratorio "The Apostles," which was produced at the Birmingham Musical Festival of 1903. The first strain (marked A in the transcription), the pair of simple musical phrases employed for ordinary verses, is very antique in character; and the secondary strain (marked B), even if a later addition to it, also must have originated under Moorish influence. The ornamental figuration of the first two and parallel phrases in this secondary strain is of true Oriental character, and appears frequently in Arab songs, as, for instance, those founded on the "Oriental chromatic" scale given by Bourgault-Ducoudray in "Trente Mélodies Populaires de Grèce et d'Orient," Paris, 1876, particularly No. 2 (quoted also by Ambros, in his "Gesch. der Musik," and by others), No. 17, and the more modern No. 29. But it is important to note that this figure, and also that of the third phrase in the same strain, frequently occur in the traditional melody of the Jews of Teutonic and Slavonic lands as well as of those around the Levant (comp. Jew. Encyc. iii. 247, s.v. 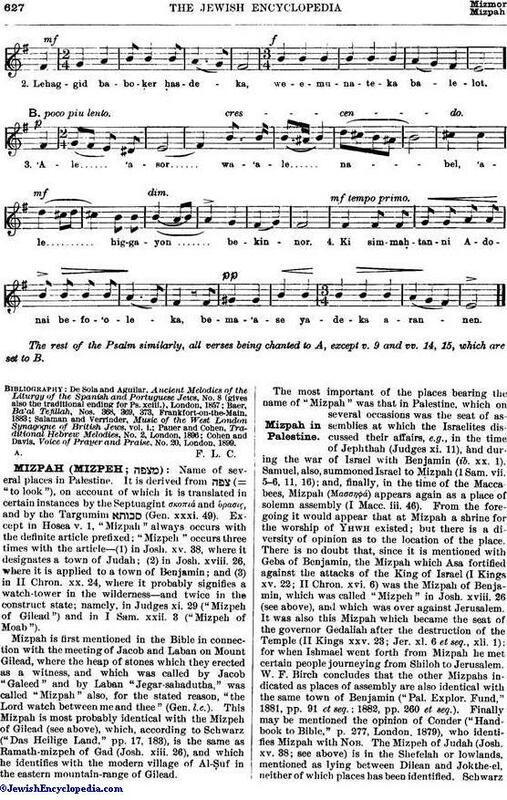 Birkat Kohanim [the Polish melody]; Geshem [melody A]; Ne'ilah; and especially Music, Synagogal). The rest of the Psalm similarly, all verses being chanted to A, except v. 9 and vv. 14, 15, which are set to B.
Cohen and Davis, Voice of Prayer and Praise, No. 20, London, 1899.